Hasn't got quite the ring of the old Jerry Lee Lewis number but big hexy balls is what I calling this new - oops did I really say that - project. I blame the lovely Karen Lewis and she says she doesn't even mind! Well I spotted some Kona hexy pre-cuts going cheap over at Justine's Simply Solids and I thought why not? So I bought two packs of pastels and two of brights! The silly bit was opening the packages and looking at the pretty colours! I should have known what would happen next. I'm not really a solids only person - not yet anyhow - so I put in a few of Karen's own screen print fabrics and I was sold! I have been hording her fabrics for a while looking for the perfect project and I think this is it - for me anyhow! 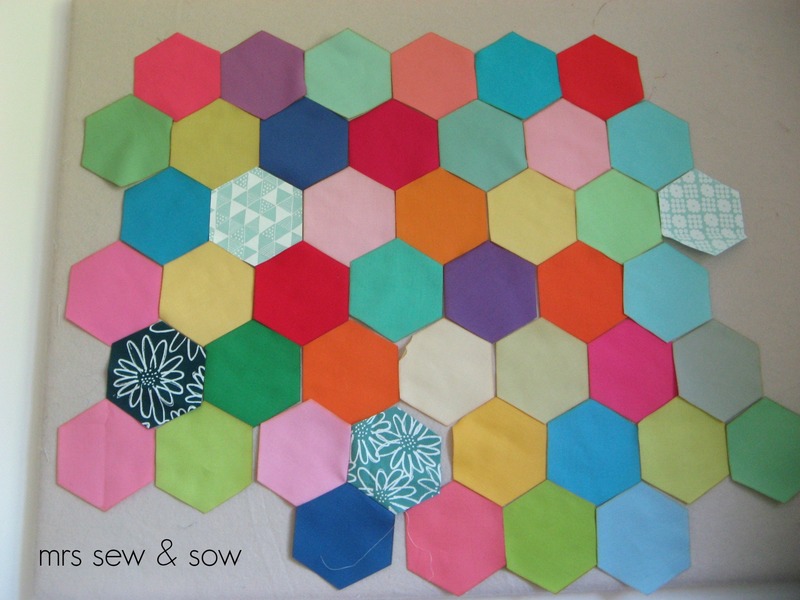 I thought of Karen as she has great fabrics and also because she recently did a tutorial for sewing hexies together using the dreaded - or rather now not so dreaded - y seam ! Not as hard as you think and coming together quite nicely! Even lying pretty flat after a bit of pressing! which I may come back to, I played around on EQ and now this is the plan. Ah EQ how I love thee for letting me sort out the scramble in my head! Here are my hexy balls so far! Two done - one and a bit to go! Think I've found my background - back of another quilt! Now I wonder if my local fabric store still sells this Klona colour? Fantastic! 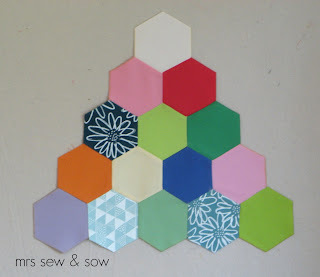 I love seeing hexies in configurations other than grandmother's flower garden. Your design for hexie balls are very cool, Nicky! Oh yeah! Your hexie balls are just awesome! The deep blue is lovely. LOVE this idea!! Your hexie balls are certainly on fire! love it when the ideas in your head make it out into the blog world. If your local no longer has this Klona, I am sure Justine can come up with something that will work, instead! What fun, it looks great so far. 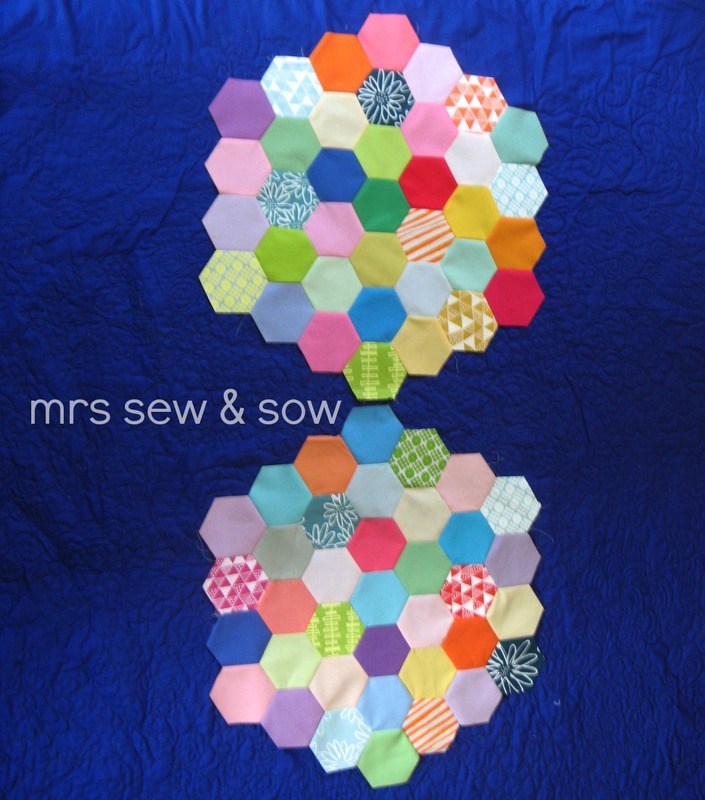 Great balls of fun - must have a play on EQ7 with hexies, never used that layout before, thanks missus. Love the Hexie balls. I have those Kona hexies somewhere half finished too, I must resurrect them. I love them, even if they are a new project!